Mounting the GPS antenna on the tailsection provides good results in general for a motorcycle. When dealing with GPS-based systems, the quality of reception from the GPS satellites is all-important as position provides a reference for all other data. Unfortunately, a moving motorcycle is not the most suitable platform for a GPS antenna. In a car the antenna moves precisely along the path of the car and remains stationary with respect to the car. On a bike, however, the antenna is both moving off the track of the wheels and leaning as the bike moves. Both provide a certain amount of error and difficulty in reception. 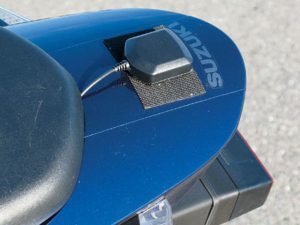 The antenna not following the exact path of the motorcycle is not a huge issue, although it is something to keep in mind when zooming in on GPS maps to analyze line choice. Depending on how the inside and outside edges of the track were recorded, the motorcycle may appear to run off the inside of corners as the bike leans far enough that a high-mounted antenna can go inside the track edge. More of a concern is when a rider transitions from side-to-side quickly and the antenna moves perpendicular to the path of travel. Not only does the movement affect the satellite reception, but also the antenna’s angle with respect to the ground also changes rapidly. This may cause a momentary decrease in the number of satellites observed as well as the quality of signal reception. There are not many ways around these difficulties without a lot of trouble and expense. However, careful antenna placement can minimize any error. The antenna must have an unobstructed view of as much of the sky as possible and not be tucked away under any bodywork or where the rider can shield some of its view. Additionally, the lower the antenna is the less side-to-side movement occurs during a transition. Fastening the antenna to the very rear of a tailsection yields good results in most cases; any lower mounting point does not provide as good a view of the sky, and the rider can obstruct the antenna if it is any further forward. The logger’s analysis software should show a channel with the number of satellites, shown here in green alternating between six and seven. That said, good results can be had by placing the antenna on the rider’s helmet. This minimizes any change in angle as the bike leans and shows as much of the sky as possible. As well, the antenna can be placed on the bottom of the fairing, facing the ground and relying on reflection for its signal. The data acquisition software should show the number of satellites in view as a channel, and you can experiment with antenna position to find what works best at your location.